For more information about this product or warranty issues, please call 1-800-380-4831 M-F: 8:30am-9:00pm (EST), Sat-Sun: 9am-6pm (EST) or email support@bose.com. Enjoy your music on the go, wherever you go. The SoundLink® Mini Bluetooth® speaker II provides full, natural sound with a deeper, more dramatic bass than you'd ever expect from a hand-held speaker. The speaker connects wirelessly to your smartphone, tablet or other Bluetooth® device, allowing you to listen to your music, videos or games whenever you want and wherever you are. Plus, you can also take calls using the built-in speakerphone. Weighing in at just over 0.67 kilograms, the SoundLink® Mini speaker II is small and light enough to carry around easily. The speaker’s low profile means you can place it almost anywhere and the low centre of gravity makes it almost impossible to tip over. The rechargeable lithium-ion battery provides up to 10 hours of playback and can be charged using most USB power sources. At home, keep the unit on the charging cradle for non-stop playback and to charge the battery as you listen so that your speaker is always ready to grab and go. The SoundLink® Mini speaker II has a range of approximately 9 metres, allowing you to enjoy high-quality sound wirelessly. Voice prompts make it easier than ever to pair your speaker with your smartphone, iPad or other Bluetooth® device. The speaker also remembers the eight most recent paired devices, so reconnecting is easier than ever. You‘d never expect such high-quality sound from a speaker this small, but the SoundLink® Mini speaker II really does prove that you don't have to compromise on performance to ensure portability. The combination of proprietary technologies and an innovative driver configuration provide a full range of sound—including deep lows—and the ultra-compact size means you have the flexibility to take your music to places it's never been before. The SoundLink® Mini speaker II is designed to combine elegance with ease. The single-piece aluminium casing is durable yet aesthetically pleasing and you’ll find only the power and volume buttons on the speaker itself—all other functions are controlled directly on your Bluetooth® device. What kind of audio sources can I use with the SoundLink® Mini Bluetooth speaker II? The speaker is designed specifically for use with today's most popular Bluetooth devices, such as smartphones, tablets and laptops. In addition, it includes an auxiliary input for a wired connection to an MP3 or similar portable player. How do I control the speaker? Power and volume controls are located on the speaker itself. Otherwise, use your smartphone or other paired device to select a playlist, streaming audio source, etc. No remote control necessary. 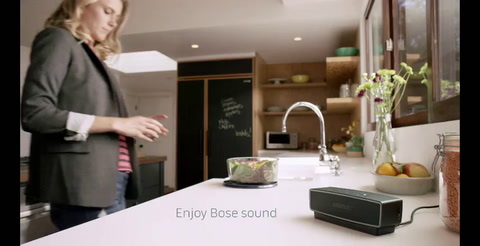 What is the wireless range of the SoundLink® Mini speaker II? On average, the speaker will work within 30 feet of your paired Bluetooth device. Walls and construction materials can affect reception at times. Can I stream music (Pandora®, Rhapsody®, etc.) from my computer to the SoundLink® Mini speaker II? What happens when my phone is streaming music to the SoundLink® Mini speaker II and a call comes in? When the speaker is turned on, the battery indicator lights up for 10 seconds, then turns off to conserve power. To check the charge, press and hold the power button to turn the indicator light back on. Green = 70% or more charge; yellow = 20 – 70%; red = less than 20% battery life. What is the playing/charging time of the battery? Battery performance varies depending on the content and the volume at which it's played. In typical usage, a fully charged battery gives you up to 10 hours. The battery will fully charge in four hours using the included cradle or wall charger, possibly longer with some USB sources or while playing music. What purpose do the voice prompts on the SoundLink® Mini Bluetooth® speaker II serve? The voice prompts serve two key purposes. First, they provide guidance during the Bluetooth pairing and connection process so the customer understands how it works. Second, they identify the connected source devices by name, simplifying usage with more than one source device. Can I use the SoundLink® Mini speaker II as part of my home wireless network? No, the Soundlink® Mini speaker II works only with the Bluetooth wireless protocol. Can the SoundLink® Mini speaker II be used to provide audio for video, such as for watching a movie on a tablet? Yes. However, the quality of the experience—specifically, synchronization between audio and video—can be influenced by the Bluetooth implementation on the viewing device. You will get the best performance by keeping the Soundlink® Mini speaker II and the device in close proximity, which minimizes wireless interference. Use of Wi-Fi® in the area also may affect performance.